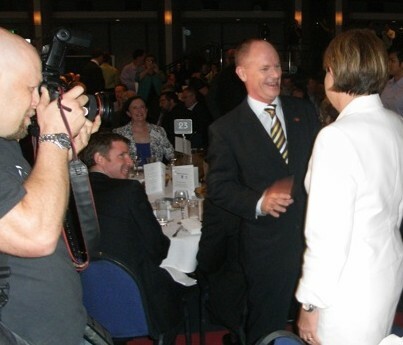 In a debate overshadowed by recent opinion polls, Premier Anna Bligh and LNP leader Campbell Newman faced off for the final time today in a leaders’ debate at the Brisbane Convention Centre. Ms Bligh told the 800-strong lunchtime audience she thought the public had given up on her government because of the “tough times” the state had been through. She said the global financial crisis and natural disasters had hit families, making it difficult for an incumbent government. “But Queensland has leapt to the front of the pack nationally despite those tough times,” she said. However Mr Newman said other states had weathered the GFC better than Queensland, which had lost its AAA credit rating and was almost $85 billion in debt. Mr Newman said the 5.7 percent unemployment rate in Queensland was the highest in the country and he pledged to bring it into line with the 4 percent rate in Western Australia within six years. Asked by moderator Chris O’Brien if he was “a bit too prickly” and “thin skinned” by refusing to shake hands with Ashgrove opponent Kate Jones yesterday, Mr Newman dodged the question and said the focus should be on the future of Queensland. Ms Bligh and Mr Newman traded blows over the premier’s failure to apologise to Queenslander for breaking promises about retaining the fuel levy, the sale of state assets and job creation while Ms Bligh claimed taxes would rise under an LNP government. In her closing speech Ms Bligh urged voters not to abandon her government because it was delivering and had “big ideas” for Queensland. Mr Newman relied on his achievements as Brisbane lord mayor to vow the LNP was ready to govern. Love the article Ian, good job! Very well done Ian….nice picture!